C. Marquard Forster was born on 20 July 1857 in St. Louis, Missouri. C. Marquard Forster died on 21 February 1912 at age 54. C. Marquard Forster, who was well known as vice president and director of St. Louis Brewing Association of St. Louis and as a director and member of the executive committee of the Title Guaranty Trust Company, was born in that city July 20, 1857. Marquard Forster, Sr., a native of Germany, came from Bavaria to the new world in early life and ultimately became one of the proprietors of Uhrig Brewery, continuing active in business until his death, which occurred January 10, 1901. C. Marquard Forster supplemented a public-school education by a course of study in Washington University of St. Louis, When a youth of nineteen he engaged in the vinegar business in connection with his father and later they conducted a vinegar and malting business at Sixth and Gratiot streets. Afterward extending the scope of their activities, they established the Hyde Park Brewery and engaged in the brewing business, with August and C. Marquard Forster as the active heads of th enterprise. They continued to direct its interests until 1889, at which time the Hyde Park Brewery was merged into the St. Louis Brewing Association, of which Mr. Forster was elected a director, while in 1900 he was chosen vice president of the corporation. He was also manager of the City Brewery, the Lafayette Brewery, the Wainright Brewery and the Hyde Park Brewery and was a very active and influential man in his field. He also became vice president and one of the directors of the Kinloch Telephone Company and was a director and member of the executive committee of the title Guaranty Trust Company. He aided in organizing the former corporation and in business circles he was recognized as a man of sound judgment, keen sagacity and indefatigable enterprise. In 1891 Mr. Forster was united in marriage to Miss Katie Schlosstein, a daughter of Louis Schlosstein, proprietor of the Green Tree Brewery. Her father was born in Bavaria, Germny, October 14, 1834, and there acquired his education. He afterward became an apprentice to the brewing business and after learning the trade he traveled over Europe, working as a journeyman until 1858, which, at the age of twenty-four years, he decided to try his fortune in America. In that year he arrived in St. Louis, where he secured employment in connection with the brewing business. Gradually he worked his way upward and ultimately became foreman of the Uhrig Brewery. In 1865 the Feuerbacher & Schlosstein Brewery was organized, with eventually became the Green Tree Brewery. 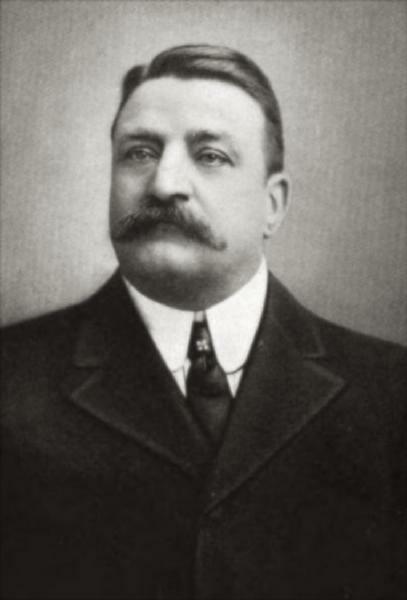 Business was conducted along successfull lines until 1889, when the business was merged into the St. Louis Brewing Association and Mr. Schlosstein retired from active connection with the business to look after his personal interests and investments. He had become the owner of considerable real estate and was a director of the South Side Bank and vice president of the Hammer Dry Plate Company, manufacturers of camera plates. He won for himself an enviable position in the business circles of the city and by his integrity and energy, intelligently directed, gained a place of prominence among the more prosperous residents of St. OLouis. He died September 19, 1901. His daughter Katie became the wife of C. Marquard Forster, and to them were born three children, Hilda, Marquard and Paula. The family circle was broken by the hand of death when on the 21st of February, 1912, the father passed away. retired from active connection with the business to look after hs In his political views Mr. Forster had always been an earnest democrat but without aspiration for office. He figured prominently in varous social organizations, holding membership in the St. Louis, Mercantile, Glen Echo and Liederkranz Clubs. He had a legion of warm friends in the city, especially among the German-American residents of St. LOouis, and his death was mourned by a host of people. As he prospered he was most generous in assisting others who needed help and there are many who have reason to speak his name with gratitude.